After going through all my addons I found the culprit. It's Toolbar Buttons	0.5.0.1, when that's disabled the Show bookmarks button is gone. This isn't happening in CTR beta 19. I'm also testing on XP. Why do you not use Toolbar Buttons 1.0 (2011-02-01) instead of 0.5.0.1 (2008-03-05)? Does this mean it's not fixable? :--) I haven't tested Toolbar Buttons 1.0 with CTR yet but the reason I haven't used it is because the icons are way better in the older version. As I said, this just started in the last two CTR betas so if I must I'll stay with beta 19. Update: I did test Toolbar Buttons 1.0 and it seems to have fixed it. The icons aren't as good but I can live with them. Last edited by marty60 on May 3rd, 2014, 8:41 pm, edited 2 times in total. Bludshot, did you install the latest version of Throbber Restored from github? The link is in the Throbber Restored reviews. Is there any CSS that will get the Australis frosted glass effect for squared tabs? So, I will add my request to the pile ... can you add an option to make the panel menu button white? I have a dark windows theme and all of the buttons on my toolbar are white with the exception of the menu button. zasxae wrote: I'm using 1.1.9beta22. I looked through all of the settings, and I find no option to disable the short panel opening animations. Or are we already talking about a different animation? Are you sure you have that feature available in the latest beta? Last edited by moztly on June 19th, 2014, 10:21 pm, edited 1 time in total. WildcatRay wrote: (Correct me if I am wrong on this.) The only other suggestion I might offer to coyote2 is to delete localstore.rdf to then basically reset the various toolbar and such to their default. After that, it might not be a bad idea to uninstall and reinstall any and all addons that may affect the browsers appearance. Thank you to both Aris and WildcatRay! An aside: I've never started with a new Profile (unless you count creating a clean Profile for testing), because I assumed (please correct me if I'm wrong) doing so would be roughly as much work as un/re-installing Firefox entirely (and be less likely to deliver a perfect result) and starting over? I'd like to think that easier options like WildcatRay kindly suggested might do the trick for me, crossing my fingers, will report the results! Thanks to WildcatRay I'm up with 1.1.9b22 now. All I had to did was disable 1.1.8 and my other addons I thought might affect appearance, then closed and deleted localstore.rdf, then started FF and installed 1.1.9b22 and enabled all my other addons before restarting. Thanks for the great info about new Profiles, Jethro. I think the reason I would just un/re-install FF instead is that (since if I understand correctly) I'd need to re-install and configure all my addons either way, and the only data I care about is in the cloud (bookmarks via Xmarks, passwords via Lastpass). But I'm way too busy to have time to do that now, so thankfully WildcatRay's advice did the trick for me! Hello Aris, thank you for creating this wonderful addon. After installing your addon, I was able to place the tabs on the bottom and get the previous tab looks by choosing "squared tabs (classic)" option. Is there a way to fix these changes? This option is only visible for Firefox 31+. Noia Fox theme, Noia Fox options developer. I changed navigation bar icons to large size which worked OK for awhile. But after playing around with customize settings, they reverted to small size and I can't change them back. How? I tried padding it out, but then the flash icon gets messed up. I'd also like to remove this margin that there is above the tabs, but again, I have no idea how. Last edited by Edellus on May 4th, 2014, 12:07 am, edited 2 times in total. Text field of "Tab (hover)" changes colour of "Tab (default)". 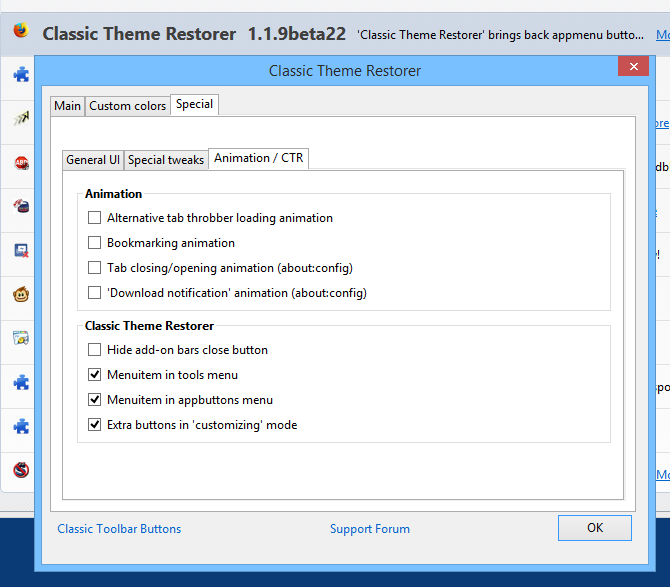 When I go to Classic Theme Restorer options, Special --> General UI tab and tick the box marked 'Navigation toolbar: remove background color (Windows AeroGlass / Win8)', it removes the background color but it leaves a border line at the top of the Navigation toolbar. Is there a way that you can adjust the code for this option to also remove the top border line as well? Prior to this option being available, I was using the following code in Stylish that I found amongst the many pages of this topic back in February/March (or possibly even early April) and I have been referring it to others who have asked about getting the Aero effect for the Navigation toolbar. This Code in Stylish not only removed the background color but also it doesn't leave the top border line like the CTR option now does. The option is for "tabs not on top" mode. There is another on to remove the border / move the border to the bookmarks toolbar. You are right that there is an option to remove the border / move the border to the bookmarks toolbar but by utilising that option, yes, the border is removed from the top of the Navigation toolbar but by doing that, it only moves the problem border to another unwanted location. level20peon wrote: The standard function for opening new tabs (CTRL+T) focuses on the website instead of the awesomebar. I think that focusing the awesomebar - even though requested - makes the usability of firefox as a whole in combination with CTR inconsistent. So isn't it at least possible to add an option to focus the website instead of the awesomebar? Not for me and like you see otherss also have asked about the urlbar focus. CTRL+T and new tab button always open a new empty tab for me where the urlbar is focused, so it obviously makes sense to do the same for CTR. But like Paul said TMP offers far more settings for clicking. That is partially true. However, if you have set a "Home Page" in the Firefox options (so no blank page is loaded) then the content is focused after loading the page using the CTRL+T shortcut. I just installed 1.1.9beta22 after you suggested to do so in the other thread, but even with the "Focus content when loading non blank page" option set in TMP it still won't focus the content but the awesomebar instead after loading the page (tested with google btw). some kind of bug appeared. their own instance in the context menu and unique name('Add-on Bar' and 'Addon Bar') in the context menu (check image link below). All my Stylish scripts are disabled.